In our last post we examined the history of the Myaamia village of Pinkwaawilenionki, also known as Pickawillany, and the brief period of instability that centered on the creation and destruction of this Myaamia village on the Great Miami River (1747-1752). Following the collapse of this village, Myaamia communities returned to the relative stability that developed after the conclusion of the Beaver Wars. Once again, villages could govern themselves by utilizing Myaamia knowledge, values, and beliefs to inform the multiple compromises that maintained good relations inside a village as well as with their neighbors both near and far. Once again, no group – European or indigenous – had the power to force their beliefs or ways onto Myaamia people. No group had the power to force Myaamia people to leave their villages, and for the most part, Myaamia people could travel unimpeded throughout Myaamionki (the place of the Myaamia, our homelands). However, just as before the Beaver Wars, travelers still had to respect their neighbors’ homes and resources, and Myaamia people still had to fear attacks from enemy groups as well as the outbreaks of disease epidemics, like measles and small pox. In this period, Myaamia people were again able to live and change according to their own habits, practices, and beliefs. In “Again We Travel a Good Path – Part I” we looked at how Myaamia people established relations with the French through intermarriage and exchange or trade. In Part II we will look with more depth at the role of Myaamia mitemhsaki (women) in maintaining a healthy village and in guiding the changes villages had to continually make in order to thrive. 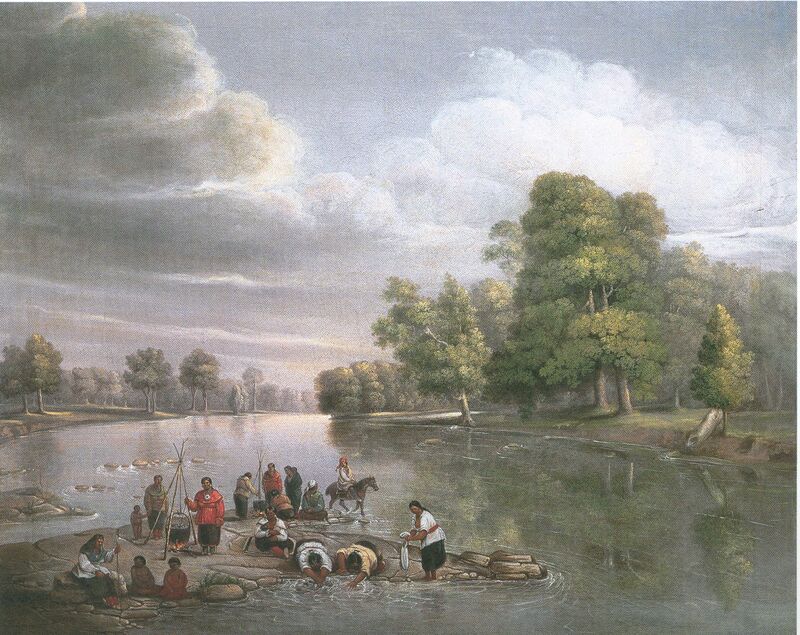 After the fateful attack in the summer of 1752, the Pinkwaawilenionki villagers made a last ditch attempt to request help from their elder brothers to the east – the Haudenosaunee (Iroquois), Shawnee, Wyandots, and Pennsylvanian British – and their grandfathers, the Delaware. This final request for military aid occurred in October of 1753 at a relatively new British town in Pennsylvania called Carlisle. The request for military aid ultimately failed, as no one wanted to risk an expanded war with the Ojibwe, Ottawa, and French. Despite this particular failure, the negotiation at Carlisle remains extremely interesting to Myaamia people in large part because it is one of the rare cases, prior to the late 1800s, where the speech of a Myaamia woman represented her people at an intertribal council. This akimaahkwia (female leader) was the wife of the late village akima, Meemeehšihkia. Unfortunately, the British did not record her name. From a European perspective, she was viewed as important only because of her deceased husband. From a Myaamia point of view, her presence at Carlisle is an indication of her influence as an akimaahkwia (female leader). As an influential leader and an eye witness to past negotiations, her speech at Carlisle served to remind everyone of their previous commitments to her village. Myaamia mitemhsa – a sketch of one of the daughters of Palaanswa (Francis Godfroy). Just as the early historical record is mostly silent on Myaamia women, so too are there few historic images of Myaamia women. Some of the earliest images of Myaamia women that we know of come from the artist George Winter. Winter made his sketches secretly as most Myaamia women refused to allow him to paint or sketch them. These refusals were likely the product of Winter’s intrusive personality and Myaamia women’s expectation of privacy. The akimaahkwia’s speech then concluded with a dramatic and powerful metaphor embodied in the gift of a large blanket made of many beaver skins with a green circle painted in the middle. She explained the gift as follows: “we acquaint all our brethren that we have prepared this beaver blanket as a seat for all our brethren to sit on in council. In the middle of it we have painted a green circle, which is the color and resemblance of our hearts, which we desire our brethren may believe are sincere towards our alliance with them.” The blanket with its painted circle was powerful symbol of her village’s unity. The gift reinforced the community’s message that they “have but one heart” and that their “heart is green and good and sound.” While the black wampum indicated that there was a desire for revenge through war, the green circle and singular green heart embodied her community’s foremost desire, a healthy peaceful relationship with their relatives to the east. This was a powerful and important moment for Myaamia people on many levels and it is a great example of the flexible system with which Myaamia people shared the responsibilities of the community between men and women. In intertribal councils it was typically the role of the akima (male civil leader) to communicate the desires of the community and negotiate on its behalf. However, in the case of Pinkwaawilenionki, the village civil leader had been killed and in cases of disruption and loss it was common for the village akimaahkwia (female civil leader) to represent the community. In this particular instance, the akimaahkwia was ideally suited to remind their allies of the very real and personal losses experienced by the village. In her efforts, the akimaahkwia was successful, at least in part. She was unable to convince the Haudenosaunee, Shawnee, Delaware, Wyandot, and British to attack the Ojibwe, Ottawa, and French. But she, and the other village leaders who came to Carlisle, successfully reaffirmed their positive relations with their elder brothers and grandfathers. These relationships would become central to Myaamia efforts to resist the invasions of the Americans, which began in the 1780s. There has been little historical attention paid to the council at Carlisle and even less attention paid to the vital role of Myaamia women in the work of governing a village. This lack of attention is the product of at least two prevailing trends. First, up until the recent past, historians have been little concerned with examining indigenous perceptions of alliance and relationship and instead have focused on the treaty making and alliance building process from a European point of view. Second, because men produced most of the original documents in the early colonial period were, they tend to focus almost exclusively on men. As a result, historians, who use these documents to write history, have been unconsciously (and sometimes consciously) biased towards the perspectives and roles of men. Since the middle of the 20th Century, this has begun change, but in some cases these changes have not trickled down into the specific histories of individual tribes. This is certainly the case with the Myaamia. As we write and research our own stories of our past, we are challenged to think and write about our history differently and to take into account groups that until recently have been ignored. The more we learn about our history, the more we realize how important it is to understand the roles and responsibilities of women in Myaamia villages. In general, Myaamia women were responsible for village agriculture, family garden plots, gathering activities, and the processing of plant produce as well as meat and hides brought back to the village by men following hunting and trapping trips. It is important to acknowledge that these roles were flexible and that at times men participated in farming and gathering and women in hunting and trapping. There were no laws forcibly separating men and women in Myaamia villages, instead a complicated and flexible series of beliefs and behaviors evolved among the Myaamia over time. These habits and practices tended to emphasize gender equity through overlapping zones of influence (see diagram below). As a result, life within a Myaamia village was neither patriarchal nor matriarchal. Instead, Myaamia women were believed to have more influence over certain places and activities and Myaamia men were believed to have more influence over others. There were also unique individuals in each village that could move freely between male and female activities and responsibilities. In some realms, influence was either divided evenly between men and women or not divided at all. 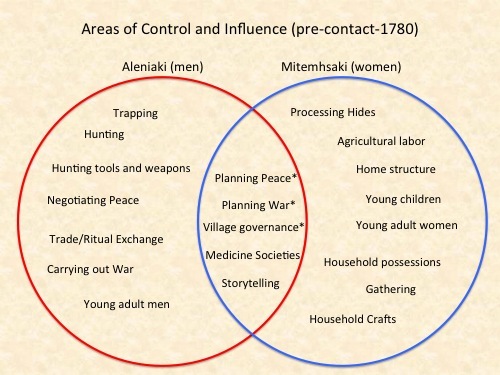 Areas of Control and Influence: This diagram generally shows the responsibilities of men and women in a typical Myaamia village. Items in the zone of overlap were shared by both groups. Those areas marked with an * were shared by both groups but discussed in separate men’s and women’s councils. It is important to note that this was a flexible system and individuals often did as they personally felt was right for them. A high level of respect was paid to individual choice and freedom. The only consistent restriction on that choice was if it brought harm to the entire community. The influence of Myaamia women began first and foremost around the home lodge. Women constructed the lodges, sometimes with the help of a few male relatives, and wove the cattail and bulrush mats that were so necessary for keeping the home insulated and dry. The head of household for a given lodge was usually a woman, and the house was perceived as being under her control. The same perception extended to household goods and any produce or meat stored in or around the dwelling. The only possessions deemed to be under the control of a husband, uncle, or adult brother were hunting implements, weapons, and personal clothing. When a divorce or separation occurred, which was as common as in any society that did not restrict divorce, the husband left his wife’s lodge taking with him only his personal belongings. Myaamia women were equally influential when it came to governing their villages. Each village had a women’s council comprised of the notable female heads of family in each village. During times of stability, this council met and discussed the important issues of the day. Together with the men’s council, they sought to create consensus around issues of importance to the community. To date, we have not located any first-person historical accounts of a women’s council in operation. European and American men were apparently never invited into this setting and so no documents describe its existence in any detail. The only likely reference that we have discovered to date comes from an 1804 diary of a Quaker presentation on farming to the Myaamia people living near Kiihkayonki. Right before the meeting was to begin, a large group of Myaamia women marched in together and sat as a group at the center of the meeting. They were there to listen to the Quaker, a man, describe how the Myaamia should change their farming practices, which was a central responsibility of women in Myaamia communities at the time. It seems quite likely that this group was the local village women’s council, though the Quaker source does not state this directly. Each village women’s council was represented by an akimaahkwia (female civil leader), it was this leader’s responsibility to represent the will of the women’s council to other leaders, the village akima (male civil leader) and possibly the women’s councils of other related Myaamia villages. In 1824, Pinšiwa (JB Richardville) and Meehcikilita (Le Gros) told C.C. Trowbridge that each leadership position had male and female counterparts. They listed these positions as: civil leader, leader’s assistant, war leader, and war leader’s assistant. Trowbridge is one of the few sources that clearly describe the roles and responsibilities of female Myaamia leaders, and this is largely the result of Trowbridge’s attempt to record everything that was being shared with him, rather than only the things that interested him. As we saw in the case of the council at Carlisle, Myaamia women were vital to the process of making and maintaining peace. This was especially true in the case of negotiations occurring within a Myaamia village. For negotiations to be successful, guests had to be treated in an appropriate manner. Guests had to be housed in comfort and well fed. Since all of the housing and most of the food was under the control of the women of the village, they held a lot of influence over the success of a negotiation. As a result, the men’s council would have struggled to initiate a negotiation without having the clear support of the women of the village and the women’s council. Myaamia women were equally influential when it came to making war. It was often the women of the village who requested that a war party go out to seek captives in order to replace relatives lost to disease or war. Female Myaamia war leaders helped organize and supply war parties. Without their supplies – clothing and food – a war party had little to no chance of success. In certain circumstances women led war parties and may have participated in combat, but these circumstances were rare and noted as such in the little documentation we have. Pinšiwa (JB Richardville) and Meehcikilita (Le Gros) also told Trowbridge that Myaamia women were influential in ending war. Trowbridge tries to play down this influence by stating that women’s “power is very limited” and that they relied “only upon their superior powers of persuasion and the general influence which as females they have over the men of the tribe.” What Trowbridge misunderstood is that in that period of time persuasion and influence were the only tools available to any Myaamia leader, male or female. Leaders could never command. To do so would be to lose respect and thereby the influence that made one a leader. Europeans and Americans tended to only observe Myaamia women at work in the agricultural fields, on gathering grounds, or outside their homes. Because these outsiders saw only the labor and missed out on the influence that resulted from this labor, they tended to view Myaamia women as a “drudge,” as someone overworked, dominated, and exploited by the men of the village. As we have explored above, the flexible system by which Myaamia people shared influence between men and women made it next to impossible for one group to dominate the other. There were historical moments of ill health and stress where husbands abused wives and visa versa, but these were unusual circumstances that did not last for very long. George Winter’s painting of Myaamia women washing clothes on the banks of the Waapaahšiki Siipiiwi (Wabash River). This image is in good part a product of George Winter’s imagination, but despite his inventions it serves as a great example of the Euro-American misperception of Myaamia women as a laborer with no political power. Across our long history as a people, the roles of men and women in Myaamia society have constantly changed. In healthy times, when we able to walk our own path, these changes have occurred in a way that is inline with our habits, practices, and beliefs. In unhealthy and stressful times, some of these changes were imposed on our community by outside groups who knowingly or unknowingly force change upon our people. Following the American invasions of 1783-1794 and 1811-1814, Americans forced a series of changes upon Myaamia people that led to an extreme decrease in the influence of Myaamia women’s councils on the decisions made by our communities. These changes will be explored in later articles that examine the American Treaty period in more detail. By the late 1800s, Myaamia people began to reverse this trend as Myaamia women once again became very influential in community governance. For example, Myaamia mitemhsaki (women) were over 60% of the voters in the 1888 election of a new chief for the Miami Tribe at Quapaw Agency in Indian Territory. This “official” Myaamia election occurred thirty years before the right to vote was extended to all women in the state of Oklahoma and thirty-two years before this right was fully embodied in the 19th Amendment to the United States Constitution. 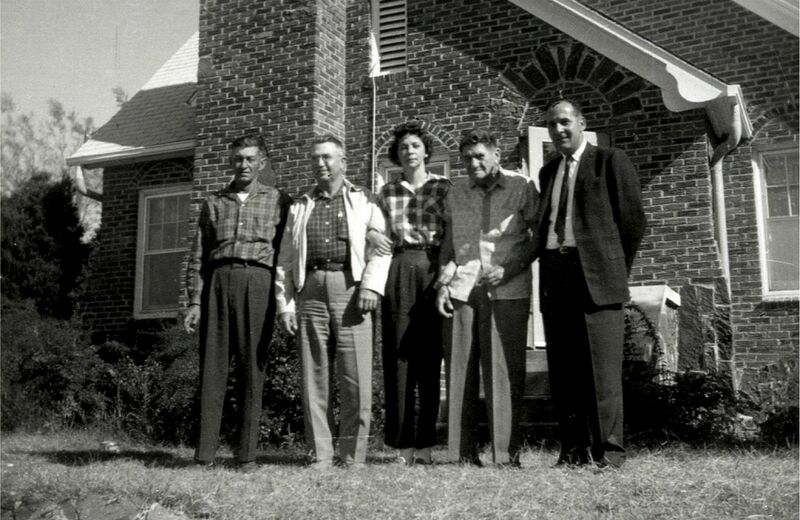 Business Committee of the Miami Tribe of Oklahoma circa 1962: Right to Left: Elmer Leonard, Forest Olds, Gloria Palmer, Harley Palmer, and Floyd Leonard. Gloria’s service on the Business Committee is but one example continuity and change in responsibilities undertaken by Myaamia mihtemsaki (women) for their people in Myaamia government since the late 1800s. If you would like to comment on this story, ask historical questions, or request a future article on a different topic, then please visit our Myaamia Community History Blog at: https://myaamiahistory.wordpress.com. This blog is a place for our community to gather together to read, learn, and discuss our history. Our history belongs to all of us and I hope we can use this blog as one place to further our knowledge and or strengthen connections to our shared past. Richard White discusses French struggles to behave like a “father,” see his passage on the Fox Wars, the attacks on Detroit, and Pickawillany in Richard White, The Middle Ground: Indians, Empires, and Republics in the Great Lakes Region, 1650-1815, Cambridge Studies in North American Indian History. (Cambridge; New York: Cambridge University Press, 1991), 82-90, 149-175, 186-222. For a full analysis of the issue of power as it relates to compromise among indigenous peoples and Europeans see White, Middle Ground, 52. Hazard, et al., Pennsylvania Colonial Records, vol. 5, 670-89. Small changes have been made to the text in the post to modernize spelling and capitalization, in order to facilitate clearer reading. For more on wampum and its use in diplomacy see Daniel K. Richter, The Ordeal of the Longhouse: The Peoples of the Iroquois League in the Era of European Colonization (Chapel Hill: North Carolina Press, 1992), 47-49. Hazard, et al., Pennsylvania Colonial Records, vol. 5, 678-79. The latter two quotes come from earlier in the negotiation when another Myaamia leader first presented the beaver blanket. The speech of the akimaahkwia was intentionally building on that introduction and emphasized their most important goal: peace with those to the east, and continued trade. Two examples of work that take into account indigenous understandings of relationship and alliance are White’s Middle Ground and Richter’s Ordeal of the Longhouse. There are now a handful of Myaamia scholars who have begun to write and publish on related topics. See work by Scott M. Shoemaker and Ashley Glassburn Falzetti, both from the Miami Nation of Indiana and Wes Leonard from the Miami Tribe of Oklahoma. The description of the Mediwiwin medicine lodge by Meehcikilita (Le Gros) indicates that men and women mixed to a greater degree when it came to sharing the knowledge of certain medicine lodges or societies. C. C. Trowbridge, W. Vernon Kinietz, and Burton Historical Collection. Meearmeear Traditions (Ann Arbor: University of Michigan Press, 1938), 77-86. Trowbridge reports briefly on the existence of men who take on women’s roles among the Myaamia, but Pinšiwa (JB Richardville) and Meehcikilita (Le Gros) apparently did not share much about this phenomena. It seems that these unique individuals were protected from outsiders to certain degree. Trowbridge, Meearmeear Traditions, 68. Bert Anson, The Miami Indians, 1st ed. (Norman: University of Oklahoma Press, 1970), 18-19. Anson claims that French sources malign the strong female influence in the home and the destructive affects of women owning most of the property in a Myaamia marriage. Pinšiwa and Meehcikilita told Trowbridge that children were addressed each morning “in a kind of lecture” by men and women. Trowbridge, Meearmeear Traditions, 38-39. Pinšiwa and Meehcikilita told Trowbridge that each position had male and female counterparts. Trowbridge explicitly states that when issues arise the village leaders meet together in council (here he seems to be speaking directly of male leaders), but it is my assumption that a parallel meeting took place among the female leaders of the village. Gerard T. Hopkins, A Mission to the Indians, from the Indian Committee of Baltimore Yearly Meeting, to Fort Wayne, in 1804. Compiled by Martha E. Tyson in 1862 (Philadelphia, T.E. Zell, 1862), 68. Thanks to Buck Woodward, from Historic Jamestown, for sharing this source with me. 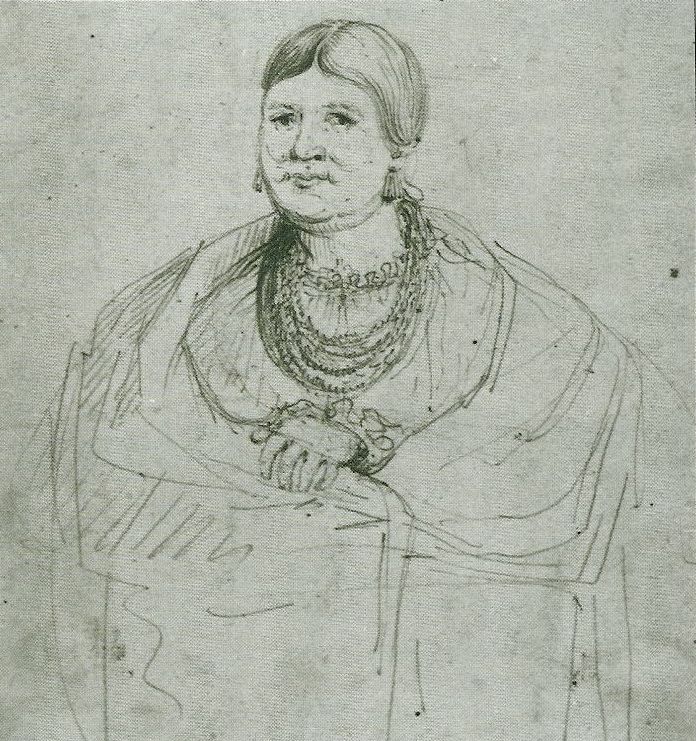 Hopkins describes that women liked to be aware of what was said in all male councils: “When the Indians hold a council they have some of their principal women placed in a little room either adjoining or overhead, where they can hear perfectly all that passes. This they treasure up in their minds, and as they are apt to have retentive memories, their traditions are faithfully preserved.” Hopkins, A Mission to the Indians, 157. Trowbridge’s work is often called an “early ethnography,” and in part it does read like the work of trained anthropologists. However, Trowbridge’s explicit mission was to learn as much about the Myaamia (and other groups) as he could in order to aid the negotiating strategies of the Governor of Michigan Territory, General Lewis Cass. We assume that to certain degree Pinšiwa and Meehcikilita understood Trowbridge’s goals were not in their best interests and at times may have manipulated what they were sharing with him accordingly. For this reason, and others, Meearmeear Traditions has to be used carefully. This influence diminishes rapidly in the Treaty years 1795-1846 as the Americans host most negotiations (food and housing) and the village councils lose influence to the tribal/national council, which had no female counterpart that we see based on our current knowledge. Pinšiwa and Meehcikilita tell the story of a Myaamia woman who dreamed of a retaliatory attack on the Iroquois and as a result helped lead a successful war party. Trowbridge, Meearmeear Traditions, 26. David D. Smits, “The ‘Squaw Drudge’: A Prime Index of Savagism,” Ethnohistory, Vol. 29, No. 4 (Autumn, 1982), 281-306. For more on the “inventive” paintings of George Winter, see Scott M. Shoemaker, “Trickster Skins: Narratives of Landscape, Representation, and the Miami Nation,” (PhD. diss., University of Minnesota, 2011), 74-122. And James Joseph Buss, Winning the West with Words: Language and Conquest in the Lower Great Lakes (Norman: University of Oklahoma Press, 2011), 97-133. Letter dated 18 January 1889 from Miami Tribal Council to Quapaw Indian Agency in the collection of the Myaamia Project. Thanks to Julia Wagner whose research on Thomas Richardville brought this document to my attention. Reblogged this on taaniši kiišikatwi?.